2. Elastic potential energy - the potential energy of an elastic object that is deformed under tension or compression. 3. 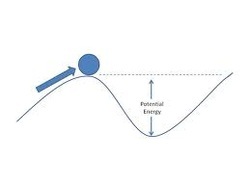 Chemical potential energy - A form of potential energy related to the structural arrangement of atoms or molecules. 4. 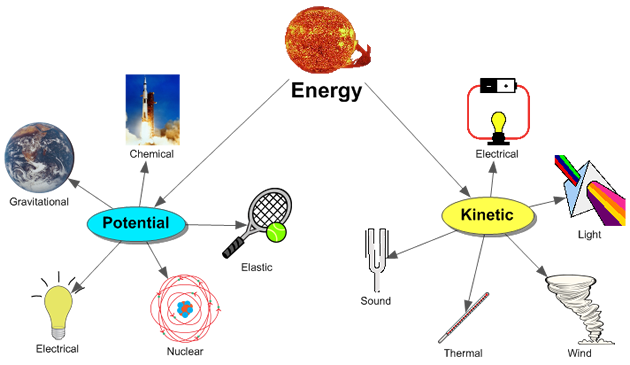 Nuclear potential energy - It is the potential energy of the particles inside an atomic nucleus. 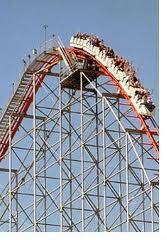 MOTION: A moving object has kinetic energy. THERMAL ENERGY: Heat and thermal energy are directly related to temperature. We can’t see individual atoms vibrating, but we can feel their kinetic energies as temperature. Like when you boil water. SOUND: Sound waves are made through the transmitted vibration of atoms. An acoustic guitar is a good example of how. ELECTROMAGNETIC: Electromagnetic energy is the same as radiation or light energy. Is kinetic because it gives off waves radiant and light energy. ELECTRIC: Electric energy is to the kinetic energy of moving electrons. Anything that uses electricity.